An anterior cervical decompression is an operation performed for arm pain due to a pinched nerve in the neck, or for spinal cord compression in the neck. 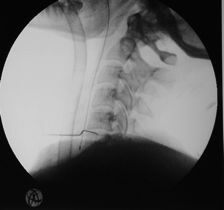 In order for it to be successful there has to be good evidence of nerve and/or spinal cord compression in the neck (preferably with an MRI scan as seen below), pain, weakness, or numbness in the arm corresponding to the MRI findings, no evidence of superimposed carpal tunnel syndrome or ulnar nerve compression, and clinical evidence of cervical myelopathy in some cases. 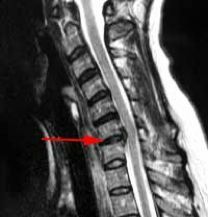 When performing an anterior cervical decompression, the entire cervical disc and the excess bone formed by wear and tear in the spine is removed in the region of the upper red arrow. This is performed with the aid of a microscope, specialised instruments, and a high speed drill. This leads to the spinal cord and nerve root being decompressed. You will be lying on your back during the surgery. Your head will be supported by a jelly support. A small skin incision is made in a skin crease in the collar region on the right side of your neck, this incision is usually about 2-3cm long. The skin in this region heals very well and these incisions are barely visible a few weeks after surgery. The muscles in the neck run vertically and thus they can be split rather than cut. The surgery involves gently pushing the carotid artery and jugular vein to the side in order to get to the spine, also the voicebox (larynx) and pharynx/ oesophagus need to be gently pushed away from in front of the spine. 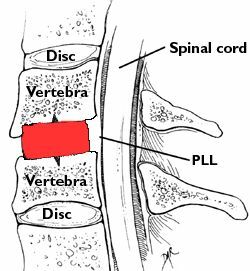 Once the spine is in view a needle is placed in the suspected disc and an X-ray is taken to make sure we have selected the correct disc to remove. The disc is then removed with special instruments and a drill using a microscope to magnify the view. 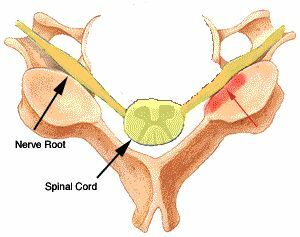 Eventually the spinal cord coverings are seen, as are the nerve roots as they leave the spine at this level. Once the decompression has been performed debate exists about whether a fusion or a disc replacement should be performed, and what material/ implant is used to perform the fusion/ disc replacement. My own preference is wherever possible to use an artificial disc or disc replacement rather than perform a fusion. There is some evidence that replacing the disc rather than performing a fusion can improve neck pain after surgery, speed the recovery from surgery, and possible reduced the wear and tear at the discs above and below the level of surgery. The suitability for a disc replacement does depend on a number of factors though, and this option may not be the best choice for all patients. Below is a video explaining the technique in performing a disc replacement using a nunec disc replacement. I now use these disc replacements exclusively as the results are very good, and they do not interfere with the quality of MRI scans in the future. In addition this this I run a UK based operative and lecture based course for spinal surgeons wishing to gain experience of this disc replacement, and teach on a similar course in Amsterdam. 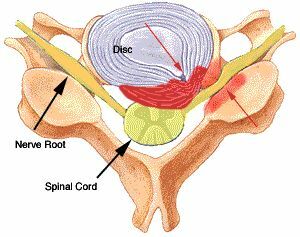 A disc replacement is not always appropriate and thus a fusion may be performed in some patients. Traditionally when a fusion was performed patients own bone in the form of a graft from the iliac crest (hip) was taken and placed at the site of the decompression. This however is a painful procedure, and the hip pain can persist long after the neck operation has settled down. 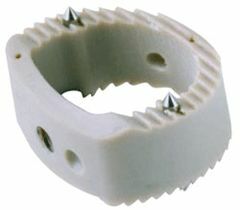 When performing a fusion own preference is to use a ‘cage’, this is made of a polymer which integrates with your own bone, and to aid fusion is packed with bone fragments produced during the decompression. The image below shows a Solis cage. In almost all cases patients are able to go home within 24 hours of surgery. Recovery using modern techniques is so rapid we are currently exploring the option of patients going home the same day as surgery.